Upon our arrival in Papua New Guinea I was hit by the tropical heat and the billowing smoke from the burning garbage. It seemed to create an acrid cacophony, the smell strangely familiar. The arrival terminal of Jackson International Airport was crowded with local faces, among them somewhere was Casper Damien; he was to be our guide through the Highlands and act as our spiritual chaperone. Casper had grown up with the ever present threat of Sanguma. A pidgin term, Sanguma is used broadly to describe the act of black magic and, as there are roughly 800 different dialects and cutural groups in Papua New Guinea, there are an equal number of interpretations of the word. As well as growing up with the belief, Casper had spent much of his university years researching and confronting it, alongside a priest named Philip Gibbs (the man who’d recommended us Casper as a guide). Casper and I shared an obsession with Sanguma, so he was hired and his knowledge was invaluable. We found him in the terminal wearing a red hat and holding a placard with our names. He was vocal about expecting a bigger crew, which I did not fault him for, as we were young, naive and paying for this trip out of our own pockets. It was clear during our cab ride that Port Moresby was rife with the scars of failed and crumbling infrastructure; car wrecks littered the motorway, and the unemployed swarmed the streets trying to scratch out a living. The population of 400,000 are largely unemployed and living below the poverty line. Huge illegal settlements have been built along the sides of the motorways and coast, and the people organised themselves along ethnic lines. Those living in the settlements held no land rights, so this meant evictions of entire settlements were commonplace. The police (who were underfunded and inefficient) were sparse and much of the constabulary roles had been outsourced to private security companies - meaning crime and instability had just become part of the monotony of life in Port Moresby. Our cab arrived at the security gates of the Ponderosa Family Hotel and we checked into one of the more expensive rooms. Once settled we went to the bar to discuss the details of the trip with Casper. We sat down, ordered some beers and smoked cigarettes, occasionally being interrupted by flashing lights and chiming bells from the pokie machines and the odd inquisitive stare from one of the patrons of the hotel bar. After my own research and reading Casper’s thesis on Sanguma, it was clear that Chimbu province was to be the epicentre of our investigation - this was the province that Casper grew up in, and he’d long believed it to be where the most prevalent belief in Kumo (a manifestation of Sanguma) had originated from. We were also to travel through Hagan to meet with a gravedigger, and Goroka to meet with members of the Melanesian Institute. This was the extent of our plans and we believed that more options would evolve the further we travelled. Trash burning outside our hotel room. We spent roughly five days in Port Moresby, an isolated city with no roads connecting it to the rest of the country. We slowly adjusted to the social and tropical climate, learning to chew betel nut (a mild and popular narcotic) and brushing up on some tok pisin (the national language). We visited the markets in Gordons and watched the people as they watched us. Many would come and speak to us to test their english and in return we’d try out our tok pisin. They would ask us why we were here. Telling the truth behind our purpose was out of the question; the word sanguma is a taboo and holds very real and dangerous power. As a foreigner I may not have believed in black magic, but it would be naive to disregard that the belief has very real and violent repercussions. Security fencing around the Ponderosa Family Hotel. It later became apparent that Port Moresby represented a microcosm of the rest of PNG. With the nation's introduction to the modern world, there was a mass migration of people to urban centres, and with this migration came an integration of the nation's 800-ish cultures, languages and ethnicities. This led to many neighbourhoods and settlements segregating themselves to avoid ethnic violence. Just like in the Highlands, Port Moresby had common epicentres of ethnic clashes - contemporary battlefields that had been exported from the Highlands. The same thing happened with the belief in black magic; cramped urban living conditions became a petri dish of esoteric mystic fears. The country’s hundreds of interpretations of an intangible belief in sorcery amalgamated into one word: Sanguma. The introduction of cell phones meant the exportation of this belief nationwide, and the adoption of a new monetary value system meant that there were those looking to manipulate the belief for financial gain. After an eventful five days in the capital being chaperoned by an embattled provincial governor and witnessing a carjacking outside our hotel, we booked our flights to Mount Hagen. There was a strong sense of anticipation as we flew across the miles of virgin jungle surrounding Port Moresby. The towns and villages were floating pontoons in a ocean of green and the rivers cut through the jungle like luminescent snakes, slithering unimpeded, unforgivingly beyond the horizon. Mount Hagen has a population of approximately 50,000 and was named after a German colonial officer. The stories I had heard of the town painted a bleak image, the kind of unruly and brutal town that would have been commonplace in any frontier of the past. The capital of the Western Highlands province, it had caught headlines in 2013 when a single mother named Kepari Leniata was accused of sorcery, butchered, then set on fire by her community. Even more shocking was that the attack occurred in full view of children, police and the fire brigade. It was Sanguma’s first international headline. We were heading there to interview a man named Thomas Kapi who worked as a gravedigger for the town. The jeep’s speed slowed as we drove through Mount Hagan’s graveyard, I could see graffiti bearing Thomas’s nickname “Skull” scrawled on the side of sheds and mausoleums. A local business owner we had been introduced to via friends in high places helped us organize our interview with Skull. Thomas was essentially on the supernatural front line of black magic; he worked as the local gravedigger, and this role included protecting the graves of the recently deceased from Sanguma. We found Thomas on top of a hill, maintaining the graves with a bush knife. From the hill you could see the surrounding mountain ranges, the nearby Catholic parish, and a small river that ran a divide between the parish grounds and the cemetery. Thomas had first noticed an increase in Sanguma in 1990. One evening he was walking a shortcut through the cemetery towards the church, and saw a woman and a child feasting on a human head by the river. Stories of cannibalism were commonplace, and are intrinsically woven into the esoteric narrative of sorcery. Someone possessed by Sanguma is compelled (not necessarily willing) to eat human flesh, often travelling to graveyards and digging up the recently deceased to consume. The reason behind this compulsion is an unyielding hunger for the power found within the human form, each part of the body holding different power is consumed accordingly. As our interview with Thomas continued, young men began to appear and watch curiously. They varied in ages, some were children and others men. One had a pet cuscus (a native subspecies of possum) on a leash, and it stared at us cautiously from behind his shoulder. It was clear that Thomas was in charge, and that he held an occult respect amongst them. He continued to speak to us, sitting on a mausoleum flanked by his men and the small cuscus; I couldn’t help but take note of the odd regality of their composition. Thomas told us that he and his boys will camp in a secluded area hidden within the graveyard, overlooking the recently buried corpse, to attempt to kill the spirit that has taken the form of an animal. Sometimes they take the form of animals that are not endemic to PNG, such as giraffes and lions. They are killed with a special stone, used in a mumu (fire pit). Once the stone hits the animal the Sanguma dies. On other occasions, they do not have the magic stone, so will resort to using traditional weapons like bows and arrows, spears and bush knives - quite often the host animal will survive the attack with a wound. Thomas and his boys will then look for an individual at the markets with a similar wound. This will be used as irrefutable evidence that this person is in fact a Sanguma. I thought about Kepari Leniata and whether this is how the beginning of her end, at the age of twenty, manifested. I wondered if Thomas and his boys potentially had anything to do with her murder and even, if not Kepari’s death, if they had a hand in the death of any other accused. I was not yet aware of the fact that I was still seeing these deaths as murders, whereas the majority of the population saw the act as something else; to them these people were no longer human. They were Sanguma, therefore killing a witch was not like killing a human - it was more akin to a shephard killing a wolf attacking his flock, so the act was justified. To get to Goroka, our next destination, meant leaving the Western Highlands province and passing through Chimbu to get to the Eastern Highlands. Casper organised a ride with some men from the Chimbu provincial government who agreed to let us hitch for a fee. Driving through the Highlands it was easy to forget our purpose; the immense mountain ranges, unpredictable vistas and people made it easy to get lost in the vehement beauty. It was a nice reprieve to be distracted by thoughts other than those of endemic violence. We would stop at the markets, chew betelnut, eat saveloy sausages and play darts for beer. We were travelling the Highlands Highway, the only densely populated stretch of road connecting the Highlands to the coast. During the drive the government men started telling us personal stories about Sanguma. All the accounts seemed like ghost stories and it was impossible to separate the embellishments from the truth. Slowly I began to grasp that my concept of truth and fact were redundant; my understanding of the two meant nothing in a world of spiritual esotericism. The idea of accountability was the lingering aspect I took away from most discussions regarding sorcery. The idea that nothing is chance or random, that every aspect of life has a purpose. This hunt for accountability largely drove Sanguma accusations. An accusation usually occurs after an inexplicable or accidental death, so the introduction of viral pandemics such as AIDS and meningococcal has led to a devastating increase of sorcery accusations. We arrived in Goroka, the capital of the Eastern Highlands province, at the same time as the evening rains. We organised to stay at the Melanesian Institute with an NGO worker. We were staying in a large raised bungalow, not dissimilar to the type you see in Queensland. The weather in Goroka was palatable - clear and sunny during the day, with heavy humidity that would make way for cool afternoons, followed by rains that you could taste coming. A cool dampness in the air seemed to pour over the nearby mountain range and provide the town with a daily reprieve from the muggy days. Our first interview was the next morning at the Melanesian Institute with the Director Jack Rarume and a researcher Joe Kokapo. They had extensive knowledge on the topic of sorcery and I hoped to be provided with a breakdown of the anatomy of the belief and accusations, versus the contemporary manifestations of Sanguma. The two experts agreed that the belief in Sanguma was spreading and increasing in frequency. In the past Sanguma was uncommon, dealt with quickly and quietly. Now accusations take place frequently, are prolonged affairs and very public. As PNG has limited infrastructure, getting a true statistic of the frequency of the accusations was largely impossible. Every number I was quoted was an estimate of around 150 - 250 accusations per annum. This increase was due to an amalgamation of variables; the introduction of new viral outbreaks meant more seemingly inexplicable deaths, leading to more accusations, meanwhile the loss of traditional boundaries and the introduction of modern infrastructure such as roads and cellphones meant a marrying of cultures. This all led to groups who had never held these beliefs now adopting Sanguma as their own - the formation of a perfect paranormal storm amidst the repercussions of modern technology. The corruption of the belief for financial gain was also a topic that was touched on, however the two men agreed it was uncommon. Their case studies showed that financial gain was a byproduct of a successful accusation. Those making the accusation almost always believed that the accused was a sorcerer, and in most cases the land of the accused would be inherited by the community not an individual. It was more common for the belief to be corrupted as a means of revenge between feuding clan members. For Jack and Joe, the issue was less about the corruption of the belief and more about studying a way to shift the perception of witchcraft in PNG. The best way to orchestrate a change is to first understand Sanguma. Jack Rarume believed that change will come gradually, as PNG has only just stepped out of the stone age and into the modern world. Europe had 1100 years to reach an age of enlightenment and PNG has had only 30 years to adjust. In these 30 years, all aspects of traditional life have dramatically changed, and sorcery is just one avenue of this evolution. The next day we arrived at the barbed wire gates of the Goroka Hospital. We had just beaten the afternoon rain as we walked into the foyer. The hospital looked more like a prison, all the windows were barred, the walls were stained with betelnut and many of the patients had to be placed on covered walkways due to overcrowding. Everything was old, rusted and on the brink of disrepair. As we walked towards the burns ward a patient nearby died, and we were struck by the sounds absolute human despair. A husband grieved publicly in the hall as we stood there awkwardly. We were soon fetched by a nurse, and we entered the overcrowded burns ward - a small room packed with roughly a dozen patients. A child with a bandaged body looked at us curiously and the smell of ointment, damp gauze and bleach lingered. Saure’s husband helped her as she struggled to sit up; I noticed her bandaged hands, as well as deep lacerations on her face. However from below her wounded brow her eyes struck me with a quiet resilience. Saure Kunde and three other women had been accused by her husband’s nephew. He had recently been diagnosed with terminal mouth cancer in Lae and he suspected sorcery. He returned home to his native Asaro and one day, when Saure and four other women were working in the garden, he made his accusation which was then carried out by the younger inebriated clan members. Saure believed she was not supposed to be included as one of the accused, and that her inclusion had been a case of "wrong place, wrong time". Saure Kunde and her husband. What followed was five days of prolonged and consistent torture. The four women were locked in a house and tortured with beatings, bush knives and hot irons. Every time Suare would deny being Sanguma she lost a finger. Saure showed me the extent of her wounds as she fought back tears and told me her story. Her breasts and chest had been burned severely, the wounds had begun to scar. Both hands had lost fingers and I also noticed that she was wearing an adult diaper due to injuries her genitalia had sustained in the attack (the Sanguma spirit is believed to inhabit the genitalia of the possessed). Saure told me that eventually her sons heard of the attack and flew back from Lae. One son fetched the police and the other an ambulance. They arrived at the house and fought the attackers to free the women. Saure was near death when she arrived at the hospital, her life saved by five blood transfusions. Neither Saure or her husband knew exactly what happened to the other women; it is believed that one woman admitted to sorcery during the torture. They both feel Saure bore the brunt of the violence. Every time Suare would deny being Sanguma she lost a finger. 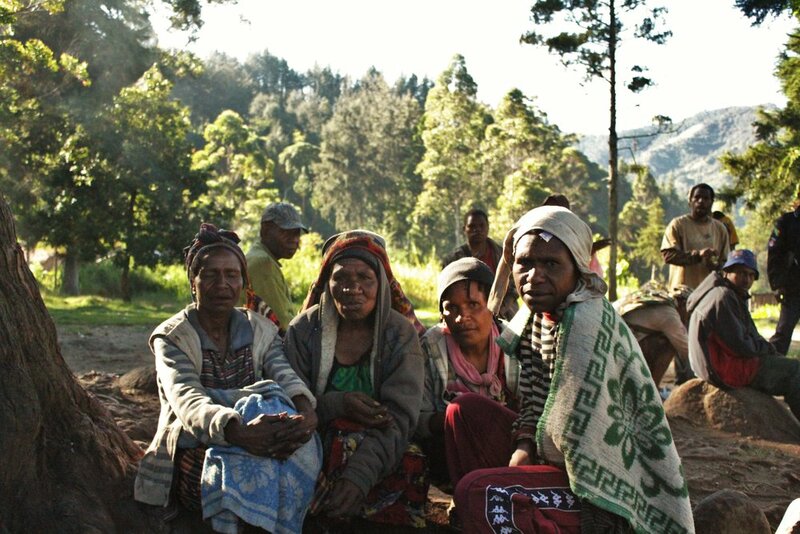 As PNG has no real government funded means of support for victims of sorcery accusations, Saure had been living in the Goroka burns ward for two months since the attack. She told me the relatives who made the accusation were arrested and then released. The judicial process would take place through a traditional method of restitution. The accusers will pay compensation in the form of pigs or kina; if they fail to pay this, the police will make arrests and Saure’s severed fingers will be used as evidence (the police were holding them as evidence). Saure was lucky as she had not admitted to practising black magic under duress of torture, so she was able to return home. Most of the accused who admit guilt are killed and buried in a toilet pit, or are forced to flee the community and their land. Due to the lack of institutional law and order, many communities revert back to their traditional tribal laws - which are often at odds with PNGs written constitution and laws - such as compensation instead of imprisonment, or payback killings as opposed to an arrest. We left Saure and the Goroka hospital feeling bitter and confused. We had now experienced the very real repercussions of the belief. We’d seen what brutality an intense autochthonous fear could cause. It became clear that this terror existed for the majority of PNG and the intensity of the beliefs entrenchment drove such violent actions. We arrived in Kundiawa the next day after getting a ride in the district ambulance for Karamue and Nomani. We were staying in a Lutheran mission house that overlooked the town. I sat on the porch and smoked a cigarette, and under a haze of lethargy I studied the town. Dwarfed by the behemoth mountains that flanked it, the town was small. The roads were not paved and had a coat of light brown mud that had become dusty in the harsh heat. Kundiawa hummed with the sound of trade and gasoline powered generators, and in the afternoon you could hear the church choir singing songs of redemption for the prisoners at the local jail. The next morning we walked a short distance to the provincial police headquarters to try and organise an interview. We stood in the foyer asking to speak to the region’s police commander, however it was unclear who was in charge. The officers either stared blankly or ignored our presence. Eventually an older man with a manicured moustache and a beret lead us upstairs, telling us to wait in the hall while he fetched someone in charge. We were ushered into an office where a short man with a neat uniform and a martial presence sat. Casper leaned over to me and told me he recognised this man from school and that he had recently returned from working in the Southern Highlands province, a violent region that had been in a state of emergency since 2006. As soon as the word Sanguma was mentioned he began a megalomanic rant about good and evil. His psychotic, hubric rhythm was impossible to follow and he delivered his speech like an evangelical sermon. He talked about the government, Jesus Christ and killing witches. I looked at Casper’s face, which looked liked it was being blasted with an airhorn. I wasn't sure if this was supposed to be our interview. After 10 minutes his excitement subsided and he introduced us to an inspector with the homicide division. The inspector gave us a number and told us he would be free the next day to discuss the details of certain cases he had worked regarding sorcery. We left after being assaulted with what felt like visceral nonsense. I was shocked and anxious about the fact that this man was in a position of power within the provincial police force. Casper believed that perhaps the violence from the Southern Highlands had had an adverse effect on his psyche. Many communities have an inherent distrust of the nation's police who are seen as violent, underfunded and ill-trained. The nation's constabulary have 4800 sworn officers to police a population of 7 million. Due to misspending, many provincial constabularies do not even have the funds to provide fuel for police vehicles and thus many crimes go uninvestigated. Most communities will usually take justice and law into their own hands. We ventured to the Kundiawa Hospital to seek out a surgeon and priest named Dr Jan Jawoski - Casper spoke of him as a Kurtzian healer whom people would travel from all over to be treated by. He had a good reputation, and as we walked into the hospital it was clear why; the hospital was the antithesis of what we saw in Goroka. The hospital was trapped in a time warp but was functioning incredibly well given that they received little to no government funding, and the although outdated the equipment was well maintained. Much of this relative success was at the behest of Dr Jawoski. We sat in the hospital mess hall with Dr Jawoski. He was Polish and had been living in PNG since 1984. He had a small frame and a grey beard that matched his grey hair, and he spoke with a slow cadence. We were informed that often victims of an accusation do not come to a hospital or will lie about the injuries sustained in an accusation, as merely stating that they are victims of an accusation can place a lifelong social stigma on an individual or be used as an admission of guilt. An increase in inter-tribal conflict often correlated with an increase in sorcery accusations - more bad luck means more of a drive for accountability, and often the blame is placed on Sanguma. The doctor told us he has tried to provide medical explanations for deaths to family members as a means to deter an accusation, often bringing the family into the operating theatre to show them the tumor or cancer that is killing their relative. However the issue faced is that they believe the cancer is caused by black magic. Jawoski also seemed to be battling the entrenchment of the belief within his staff, as he would often hear colleagues advising patients that their sickness or misfortune is supernatural in nature. He said even other denominations of churches are often taking parts in accusations, and mentioned hearing of a sorcerer being killed inside a church. The doctor scoffed at the mention of police assistance, stating “they are either drunk or not at their post” and due to the prevalence of the belief the police often side with the accuser, sometimes facilitating the accusation. It all reminded me of a Martin Luther King quote “Hate begets hate; violence begets violence”. Dr Jawoski called it a cycle of violence and he saw no end to it - for as long as the government was failing in all avenues of infrastructure, violence would remain as the means of informal governance. A victim of domestic violence - high rates of domestic violence plague PNG's hospital admissions. Dr Jawoski's does his rounds. It seemed that all violent admissions to the hospital were increasing, and that sorcery accusations were included in this overall rise. He referred to it as an "epidemic of violence" and he felt that his hospital nor any other hospital in the nation was prepared to deal with the overall increase of violence. Government funding was either misspent or fell victim to institutional corruption, leaving much of the country’s infrastructure in a state of rot. As we exited the hospital foyer Dr Jawoski’s final words lingered “our country is deteriorating.” I meditated on his passing sentiments and those of the others I had met, and began to understand it invariably. Looking back at the hospital I met eyes with some Chimbu men who were grieving. Their sullen faces were covered in grey ash, a symbol of grief and mourning. Someone had died and I wondered if they were about to perpetuate another grim statistic. The following five days we experienced firsthand the inefficiency and and disorganisation of the police. All our attempts at organising an interview failed, and on one occasion I visited the Kundiawa police headquarters only to find two officers passed out and spooning their assault rifles. We didn’t have enough money to facilitate faith in the local police to commit to an interview, so we left for the Gembogl district north of Kundiawa . Gembogl is a small isolated district nestled amongst sub-tropical mountain ranges. We drove up a valley in the back of an old, beat-up ute driven by a priest and as the altitude began to climb, we saw a change in the environment. A crisp coldness took the place of the tropical humidity, the sky began to grey and the mountains appeared to be swallowing us; we were entering a biome almost hidden from time. Another of the ute’s passengers told us we were heading into the heart of PNG - a heart which resided in the shadow of the country’s highest mountain, Mount Wilhelm. Casper grew up in the district so the men in the ute recognised him and knew of his previous work. I assumed that they knew that our visit was likely related to Sanguma. After a series of questions, one of the men began to accuse us, using very animated gestures, of trying to disprove the reality of black magic. I assured him this was not our intention, telling him it was not our place to disprove this belief but instead to understand this belief. His response was an angry “But it is not a belief, it is real!” He told us that his father was a witch and “could grow wings and fly”. Another less-animated man told us he did not believe in sorcery but admitted he did take precautions against it in these valleys. This kind of oxymoronic sentiment was common . The hostility from the first man was the epitome of the national sentiments relating to the international condemnation of sorcery, meanwhile the sentiments of the second man represented a passive entrenchment of the belief in sorcery that was endemic in all institutions of PNG life. The vehicle came to an abrupt stop as a group of locals excitedly flagged us down. Casper told us they had captured a rare bird. They pointed down the bank to a hut and as I approached I could hear what sounded like a baby screaming. As I got closer I saw a white owl with large black eyes in a cramped cage. It’s feathers had matted into the mesh and it was clearly in a state of distress. I watched it struggle and cry for a few minutes and made my way back to the ute, not really understanding the significance of this owl. One of the men leaned over and told me that this owl is a bad omen and is a harbinger of death, he said that the Sanguma use them. Harbinger of death, vessel for Sanguma. It was roughly another two hours until we arrived at the local parish we were to stay at. Our first sight of the church was a monolithic blue steeple; it seemed strangely alien in contrast to its surrounding. It had been built by German missionaries in the 1950s and its construction did not come without bloodshed - a cultural bloodletting familiar in times of colonial expansion. The parish minister was a good friend of Casper, that night we had dinner with the minister and his family and discussed national politics and the nations lack of infrastructure until a power cut ironically sent us all to bed early. We interviewed five people in the minister's living room the following afternoon. William Tombo was a young man who was a youth worker for the parish, an older man Paul Kuamo who was a former priest, and Matias and Andreas Okook were the parents of a little nine year old girl Katia who was keeping herself busy with paper and pens. William had worked for the church for many years and like most PNG nationals he was devoutly religious. He had also been exorcising sorcerers of their dark affliction alongside a local priest; he had done this a total of 17 times and 13 of these cases were successful in casting out the evil spirit. God played an important role in their work and assisted them in identifying the Sanguma within their community, however an exorcism would not occur unless contact was instigated by the individual who was possessed. William told us there are a strict set of rules that the Sanguma needs to follow in order to be cured: they need to fast and pray in order to weaken the evil spirit for the final exorcism. William and the church had developed a non-violent solution to sorcery, it was an option that existed as alternative to an accusation and was a spiritual resolution as opposed to one governed by intense violence. However this solution was heavily reliant on those whom self-identified as Sanguma seeking assistance. It didn't stop the false accusations of innocent individuals or the manipulations of the belief. This solution did not nullify or change the violent perception of what a Sanguma was. Paul Kuamo by contrast had been present for violent accusations and his belief in the danger that Sanguma posed was firm. He told us about the death of a young school boy where afterwards an accusation was levelled at both an elderly woman and a young couple. They were locked in a hut and tortured severely. During the torture, Paul knelt down next to the old woman and asked her what form the Sanguma took, she responded that the spirit was a snake, and at that moment he saw a snake crawl out of the skin on her leg. Paul was angry at the government and the international community for the condemnation of these accusations; he believed they did not understand the reality that existed at the village level, that Sanguma is real and is killing and attacking the community. Paul was the manifestation of a national distrust of the government at the rural level. Many believe that the government are trying to suppress the truth behind the reality of sorcery because the government itself has been infiltrated by Sanguma. This theory became popular with the recent repealing of the PNG Sorcery Act of 1971. This act had outlawed all forms of black magic and was originally designed as a means to provide a legal avenue for accusations, as opposed to the violent traditional method. Unfortunately it had another effect, where many of those guilty of murdering an accused sorcerer used it as a viable avenue for a legal defence. The scrapping of this act largely came about through international condemnation and pressure on the government to act. Many rural Papua New Guinean nationals harbour a quiet resentment towards foreigners due to this interference and condemnation. It was towards the end of our interview when the nine year old Katia revealed herself to be the Sanguma. I felt my spine chill and my hands go clammy, and it was the first time that Sanguma truly frightened me. Katia had big brown eyes and wore a pink shirt and a cross around her neck, the latter a gift she had received from William who had assisted in her exorcism. Her story had begun when her mother adopted a young woman. The woman was a sorcerer and groomed little Katia with sweets and stories, eventually passing on the malevolent spirit in the form of a blowfly. Katia told us how the spirit burrowed into her soul, compelling her to seek out excrement and blood to feast on and telling her to slaughter livestock and humans. Katia became traumatised and approached her parents screaming inconsolably and begging them to take her to the priest. So William and the local priest performed an exorcism on little Katia in the old German church below an effigy of Christ and the Sanguma relinquished Katia’s soul. I asked Katia what form the Sanguma took and she told me she had two kumo: a blowfly and a white owl, just like the one we had seen caged on our drive up the valley. Hearing these words spoken from the mouth of a child was terrifying. Had the community found out about Katia before the parish, the story would have likely ended with Katia’s expulsion from the valley or violent death. For the next three days I was consumed by a dreadful sense of melancholia, and I felt spent after the last interview and the invitation. The day following the interview we climbed Mount Wilhelm, the highest peak in PNG. The ferocious exercise of climbing that mountain gave me a cathartic reprieve from my thoughts of anger and guilt. We scaled the mountain with some speed, moving quickly through the night and the moonscape of Mount Wilhelm. Once we arrived at the summit a cocktail of endorphins and the immense beauty lifted my sullen mood; we could see almost the entirety of PNG, from north coast to south coast. The summit of Mount Wilhelm. However I still had creeping thoughts in the back of my mind, running through countless hypotheticals of “what if?” and “why didn't I?” Thoughts lingered back on the invitation that had been extended. I felt haunted. What had happened to the accused in this scenario? Another statistic likely lost in a morally ambiguous and metaphysical landscape of beautiful greens. I felt more traumatised by the hypotheticals of the violence than the real violence I had seen. It was in this that Sanguma equivocally held its greatest strength. It is in the haze of ambiguity were ghost stories manifest and fortify. This haze was only just beginning to clear for Papua New Guinea. I began to try rationalising Sanguma with a Western gaze - maybe Sanguma was a traditional interpretation of paranoid schizophrenia? I thought of Katia and how she had violent delusions which could have been diagnosed as schizophrenic episodes, yet an exorcism had seemingly relieved her symptoms. I felt the more I knew the less it made sense. On our journey back from the mountains I began to suffer from esophageal ulcers, a byproduct of the antimalarial doxycycline I’d been taking. It was painful to swallow most food as the doxy had burnt the lining of my throat; I could only consume water, milk and bananas. Casper had organised a lift with yet another priest who would take us from Kundiawa to a parish in the newly formed Giowaka province. It was night when we left Kundiawa, I was feeling exhausted from the ulcers and the events of the previous week. I looked out at the streets as we left town, heading out once again on the Highlands Highway. The drunks and faceless shadows moving aimlessly through the streets soon gave way to stark silhouettes of jungle and mountains, creating a darkness even greater than that of the night sky which still held the luminosity of the stars. It was easy to look on to this and understand how a nightmare like Sanguma could manifest in such an environment. We arrived at the Kerowagi parish in the Giowaka province and immediately went to sleep in beds that looked like stale bread. I awoke early the next morning looked out the window at the parish grounds. The lawns were neatly mowed and the buildings were well maintained. On the periphery of the parish grounds you could see the small settlements that made up the greater Kerowagi. This township was nothing compared to the hustle and bustle of the other provincial capitals like Kundiawa and Goroka. I went into the church where the priest and his flock were singing and listened until the service finished. Casper told me outside that we were waiting for one of the government men who had initially taken us to Goroka. He held some information relating to an accusation victim in the area. However two days passed with no response from the man and so I spoke to Casper, who said he may be able to find someone through the parish. Molbo Dinbi arrived late morning. He wore unassuming clothes and his face had striking features that had been weathered by age. Molbo was a polygamist who had two wives and six children, and early in 2014 he had been accused alongside his wife of practising sorcery. The community separated them. Molbo was beaten and tortured outside while his wife was locked in a hut and tortured; she bore the brunt of the violence. He remained steadfast in his innocence however his wife’s family had had a history of Sanguma, so her pleas of innocence were ignored. Eventually they were rescued by the mobile police squad however his wife had already admitted guilt under the duress of torture and fled the region. Molbo's property and belongings were torched and destroyed and he has lived with the stigma of Sanguma since the attack, becoming a sort of social leper among his community. The accusation stemmed from a death in the community which had been blamed on Molbo's wife, who had provided the deceased with a cup of tea days earlier. Molbo didn't know whether his wife was in fact Sanguma but he harboured a resentment towards her, telling me "had it not been for her I would not have been accused." Molbo spoke “ I am happy that she left, I don’t want to know where she is now. Because of her the whole community went against me”. For Papua New Guinea this sense of community runs deep; the Western concept of individualism is foreign. Papua New Guineans are born into a community where every woman is your mother and every man is your father. Expulsion from this community is a death sentence, as not belonging to a clan or not having a 'tokplace' literally strips you of your identity and your story. Without a clan or a community you are insignificant - you do not exist, you are (for lack of a better word) an untouchable. This was the void that Molbo Dinbi now inhabited. He now lived with his second wife, however he was no more than a financial and social burden to his wife and children. His only assistance came from the Catholic parish in Kerowagi, but there was no shedding the stigma that had already tainted him. With no real government support or mediation he was likely to remain a cog in the malevolent cycle of Sanguma until his death. The only support networks that seemed to be offered to victims of sorcery related attacks were through Oxfam and the Catholic church. Oxfam had a hands off approach when dealing with sorcery and took the role of financial facilitator for smaller local groups such as KUP woman for peace, a women’s group who assist in the mediation of tribal fighting and repatriation of victims of sorcery (an approach I respected). Oxfam appeared to be placing money into Papua New Guinean solutions for a Papua New Guinean problem. However we were unable to speak to this group as Oxfam were very protective of them after an incident involving a Sydney based journalist had left one of the KUP woman with a compound fracture to her arm during a village visit. The church were more hands on as they had a larger reach than the NGOs and were often the only support system in place for victims of sorcery in remote regions, usually providing accusation victims with housing and food. However both were limited in a country as large and underdeveloped as Papua New Guinea. Kerowagi parish and Molbo Dinbi was the concluding story of our journey and we headed to Mount Hagan to catch a flight back to Port Moresby. As I sat in the cramped bus back to Hagan and reflected, my mind felt like a soup of notional ideas. Only one thing was clear to me; sorcery was real for Papua New Guinea, but it would never be real for me or the international community. The West will never understand the reality of an esoteric violence like Sanguma. Our metaphysical receptors have been calloused by 1100 years of modern development. Sanguma is a reality that exists beyond limitations of modern vocabularies. A feeling of dread deep in a primordial bone, it resides in a trench in the ancient annals of superstition. A terrible metaphysical gnosticism that the West has forgotten it once shared. A terror that took a millennium to shake. I can only speak from my own experience with sorcery as a foreigner; for me the torture and murder of anyone under the guise of witchcraft could never be justified. However I haven't grown up with a constantly reinforced fear of Sanguma. The belief has not been entrenched and fortified in me from my conception, therefore my opinion to a PNG national is redundant because I do not and never will verily understand. This unwillingness of international communities to attempt to understand the current perception of Sanguma leads to division between the groups pushing for government action and the majority of the national population. For the average Papua New Guinean itt is as though the West is pointing to a poisonous snake poised to strike at them and telling them not to kill it as the deadly snake does not exist. In a country with a myriad of social, environmental, political and economic issues it is already a delicate ecosystem and a push for reform without an attempt to understand is likely to cause more division and damage than improvement. Papua New Guinea has the highest homicide rate per capita for the South Pacific, it has the highest rates of gender based violence in the world (55% of woman in PNG have been raped) and the police force is chronically underfunded (4800 police officers to police a population of 7 million). They have the second lowest GDP in the Oceania region and the highest rates of corruption. When sorcery is placed in context with the manifold of problems that the country faces, it registers as a blemish on the tip of a behemoth iceberg. International pressure relating to reforms surrounding witch hunts can seem unrealistic and misplaced for an already poverty stricken country. It is a bittersweet truth for me having met victims of Sanguma related accusations, but sorcery related violence registers on the low end of the urgent priorities that the country must attempt rectify. These concluding sentiments were cemented in me as I waited to board my departing flight for Brisbane at Jackson International Airport, when an arrest warrant was released for the Prime Minister Sir Peter O'Neill for corruption charges. He was sheltering in his fortified compound protected by private security. The arrest warrant stemmed from investigations made by an anti-corruption body named 'taskforce sweep'. The PM quickly made moves to dismantle the taskforce and replaced the Attorney General and Police Commissioner. The warrant was dropped. While the political elites were busy squabbling over stolen money, people like Suare Kande, Molbo Dinbi, Dr Jawoski and the majority of the nation were suffering through deteriorating infrastructure and a lack of development which had facilitated violence in all its forms. From what I had learnt and seen from my two months this was business as usual.